James Thomas Hinshaw3,7,8,9,10,11 [Thomas James Hinshaw12]. Born Feb 4 18923,7,10,11,12,13 [Feb - 18931,8,9], Tobaccoville, Forsyth County, North Carolina3,7,10,11,12,13. Hinshaw, James B., head-of-household, age 62, born in North Carolina; parents born in North Carolina; owned home; occupation: farmer, general farm. Hinshaw, Tabitha C., wife, age 62, born in North Carolina; parents born in North Carolina. Hinshaw, James T., son, age 26, born in North Carolina; parents born in North Carolina; occupation: laborer, farm. Hinshaw, Mattie T., daughter-in-law, age 25, born in North Carolina; parents born in North Carolina. Hinshaw, James T., head-of-household, age 38, born in North Carolina; parents born in North Carolina; first married at age 26; rented home ($25 rent); no radio in home; occupation: concrete worker, concrete contractor; World War I veteran. Hinshaw, Treva K., wife, age 36, born in North Carolina; parents born in North Carolina; first married at age 25. Hinshaw, James T. Jr., son, age 9, born in North Carolina; parents born in North Carolina; attended school. Hinshaw, Miller K., son, age 7, born in North Carolina; parents born in North Carolina. Hinshaw, Jean, daughter, age 4 years 8 months, born in North Carolina; parents born in North Carolina. Hinshaw, David S. [initial unclear], son, age 2 years 11 months, born in North Carolina; parents born in North Carolina. Hinshaw, James T., head-of-household, age 47, born in North Carolina; completed 3rd grade; on Apr 1 1935 was living in the same house; rented home ($10/month rent); occupation: loader, transfer company; worked 45 weeks in 1939; $800 wages in 1939. 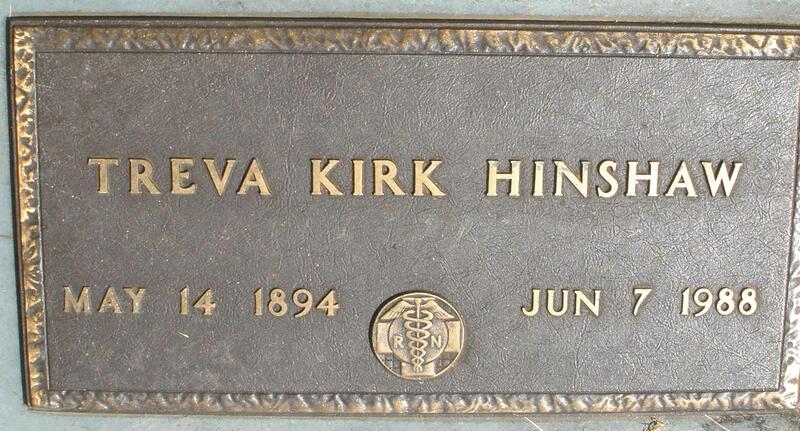 Hinshaw, Treva K., wife, age 45, born in North Carolina; completed 7th grade; on Apr 1 1935 was living in the same house. Hinshaw, James T. Jr., son, age 19, born in North Carolina; completed 4 years of high school; on Apr 1 1935 was living in the same house; occupation: tinner, tinning company; worked 47 weeks in 1939; $700 wages in 1939. Hinshaw, Miller K., son, age 17, born in North Carolina; completed 2 years of high school; on Apr 1 1935 was living in the same house; attended school. Hinshaw, Jean, daughter, age 14, born in North Carolina; completed 1 year of high school; on Apr 1 1935 was living in the same house; attended school. Hinshaw, David, son, age 12, born in North Carolina; completed 5th grade; on Apr 1 1935 was living in the same house; attended school. Hinshaw, Kelion, son, age 6, born in North Carolina; on Apr 1 1935 was living in the same house; attended school. Obituary of James Thomas Hinshaw, Jr..
1900 census, Old Richmond Township, Forsyth County, North Carolina; roll T623-1194, ED 28, page 1A, line #8, dwelling #2, family #2. 1920 census, Old Richmond Township, Forsyth County, North Carolina; roll T625-1297, ED 77, page 6B, line #59, dwelling #115, family #117. North Carolina Deaths, 1976-77; http://www.ancestry.com. 1910 census, Old Richmond Township, Forsyth County, North Carolina; roll T624-1110, ED 59, page 169A, line #15, dwelling #2, family #2. Ancestry Family Tree data "Carper Family History Site" posted by "billiebevers". Ancestry Family Tree data "Stewart Family File Copy" posted by "StewartWandaL". 1900 census, Fall Creek Township, Yadkin County, North Carolina; roll T623-1225, ED 137, page 12B, line #89, dwelling #229, family #229. 1910 census, Rockford Township, Surry County, North Carolina; roll T624-1133, ED 139, page 5B, line #82, dwelling #81, family #81.